I am here in Xi’an, China, struggling a little bit with the language barrier, unsure what exactly I’m eating, but enjoying a handful of beers and still in awe at the experience I had today. 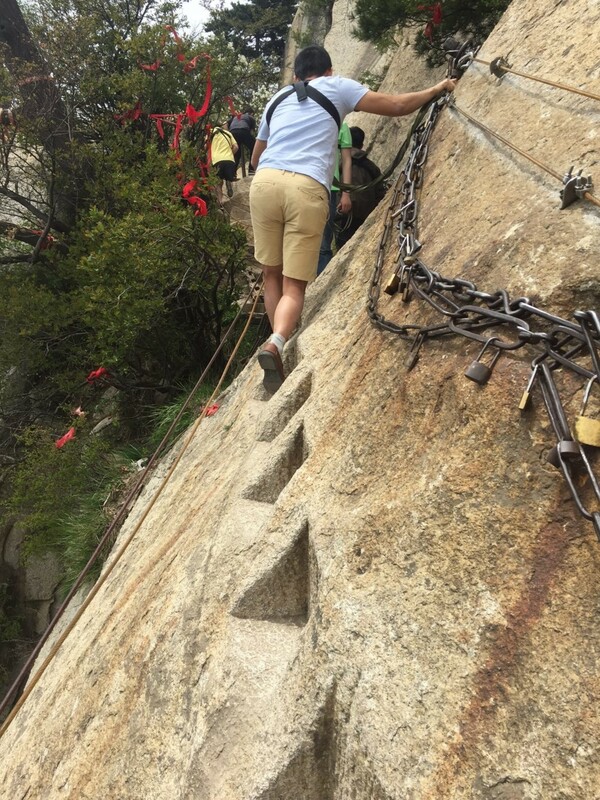 My journey took me to Huashan, in Shanxxi province. Having craftily navigated my way here from Xi’an by Bullet Train, I managed to use my sixth sense and the multitude of screenshots on my phone to what I thought was a bus stop, and waited for what I hoped would be a bus. Somehow I managed to get the bus, and better still, I managed to get off at the right place. Here I bought a national park ticket, followed by a ticket for a second bus which then drove me to another ticket booth which sold me a ticket for a cable car which then took me up the mountain. Phew! 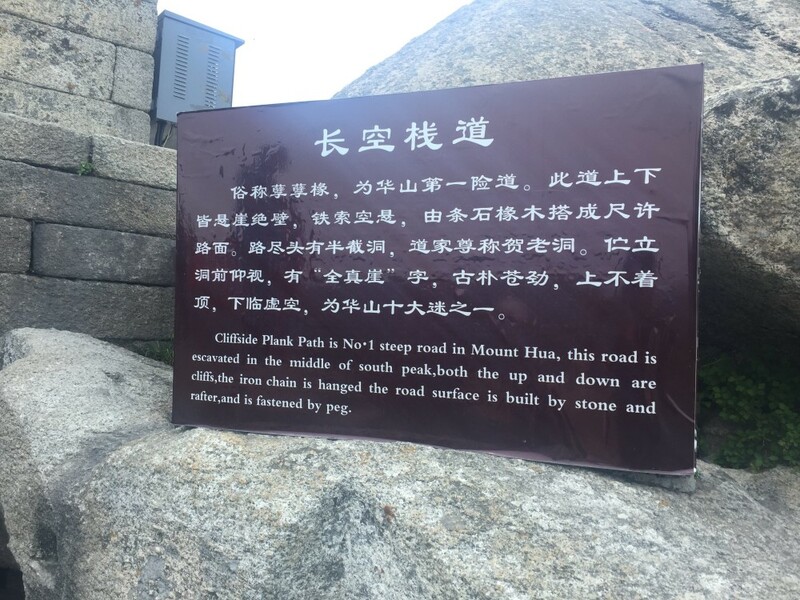 There’s four peaks on Mt Huashan, aptly named after the compass. I chose to head up to the West Peak, and I tell you, this is definitely the best option. 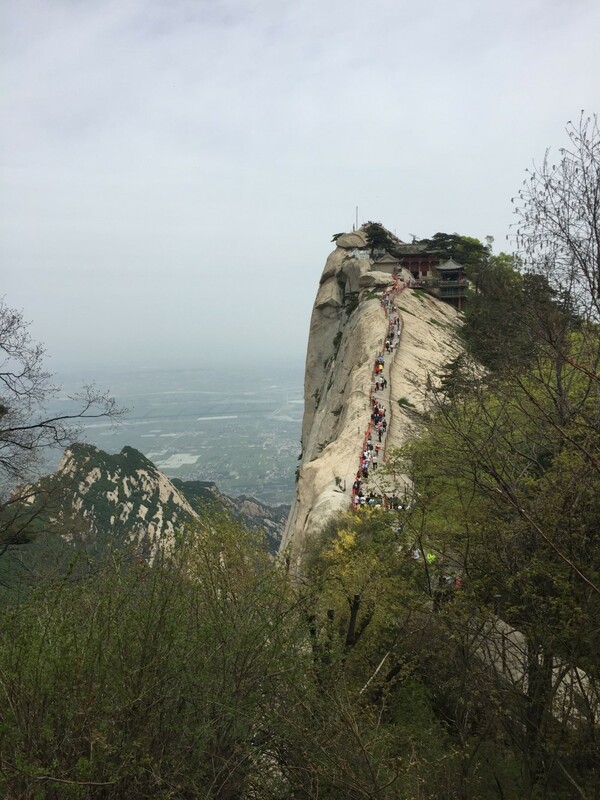 Read my other blogs – I can be pretty lazy sometimes, and the West Peak is the tallest. The view up there was incredible. It still seems amazing that one minute you’re on the flat plains of China, and the next minute you’re up in the mountains. I decided I’d hike the peaks anti clockwise, starting with the West and finishing with the north – as I said, the West was higher than the North so my net elevation change would be down rather than up. If the West was good, the South was next level amazing, as it faced into the mountain range rather than away from it towards the plains like the North did. The peak capped out at around the same height as Whistler, and so the temperature was spot on for hiking. 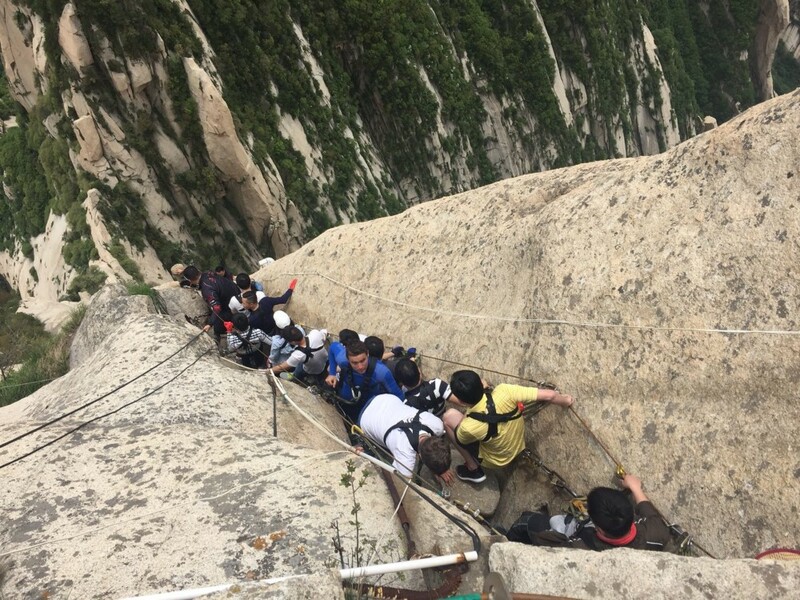 Natural beauty aside, there was a specific reason I’d decided that Mt Huashan was a bucket list visit. On the south face, not too far from the south peak, you’ll find The Plank in the Sky. 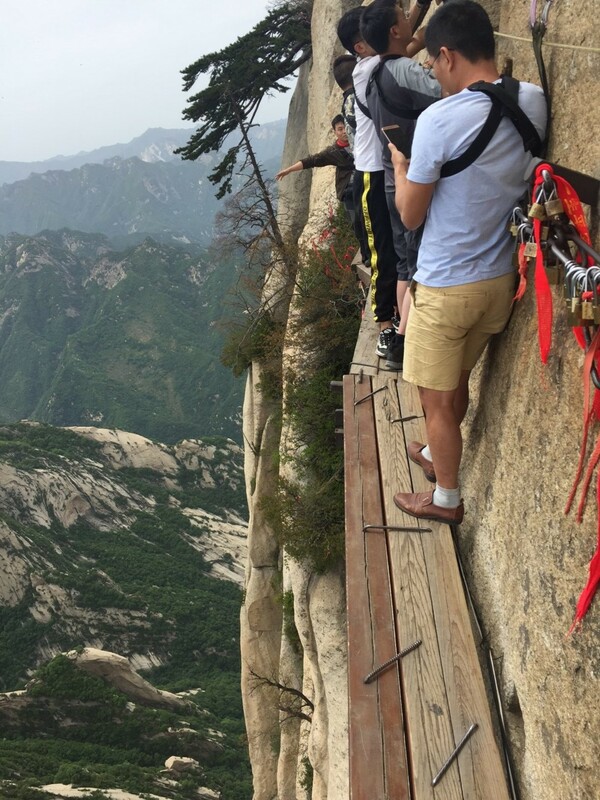 It’s a precarious wooden pathway to one of the mountaintop temples and shrines on Mt Huashan. There were a few different pathways to different temples, but this one looked like the most bizarre, and definitely one to attempt. So I bee lined it there. To put it in perspective, I arrived at a small outcrop with an exceptionally narrow pathway leading along off to the right. It’s perhaps two feet wide, if that. Just enough to fit a person along it. On my right, a sheer cliff heading vertically up. On my left, a sheer cliff heading vertically down, almost the entire 2000 meters to the valley floor. And standing between me and certain death, a small railing that barely comes up to my waist. Walking along in one direction would be bad enough, but ironically this is a two way path. So there is some fairly intimate maneuvering taking place any time someone wants to pass… which, as it happens, is fairly often. For people who want a selfie but without the danger, this is where they stop. For adrenaline seekers like myself with a craving for out-of-the-ordinary, we continue. The path itself is not bad, as it’s carved into the rock so I do at least feel moderately safe standing on it. But, all that’s about to change. Looming ahead, an umbrella is sheepishly tied to the railing, where a handful of people are assisting tourists with climbing harnesses. I harnessed up, and attached my dual clips to the guide wires which run along the cliff face. The railing continues to give a little comfort, although the emphasis is really on ‘little.’ We reach a sudden dead end, which is accompanied by a vertical ladder sandwiched into a crevasse in the rock. Descending the ladder, I end up hanging one footed over the edge, both hands clasped onto the guide wire, as a string of people try to get past me in the other direction. It’s definitely one of those moments I won’t forget: hanging off the side of a ladder, 2000m up a vertical rock face. I reach the end of the ladder, and I’m back to rock carved out of the mountainside, but albeit only just the width of my foot. So walking requires one foot in front of the other. Let’s not forget, that this is still two way. A little further along is where things become really interesting. On the one hand, the path becomes a little wider – I can put both feet next to each other quite comfortably. But, as the cliff is now so sheer, there is no actual path at all. It is simply some wooden planks stapled together and resting on steel pegs which have been driven into the mountainside. I stepped foot onto the plank fairly cautiously at first, but as soon as it took my full weight (and of course it would, seeing all the others on the planks) it is fairly easy to put a little trust into it. And so the precarious shuffle continues. 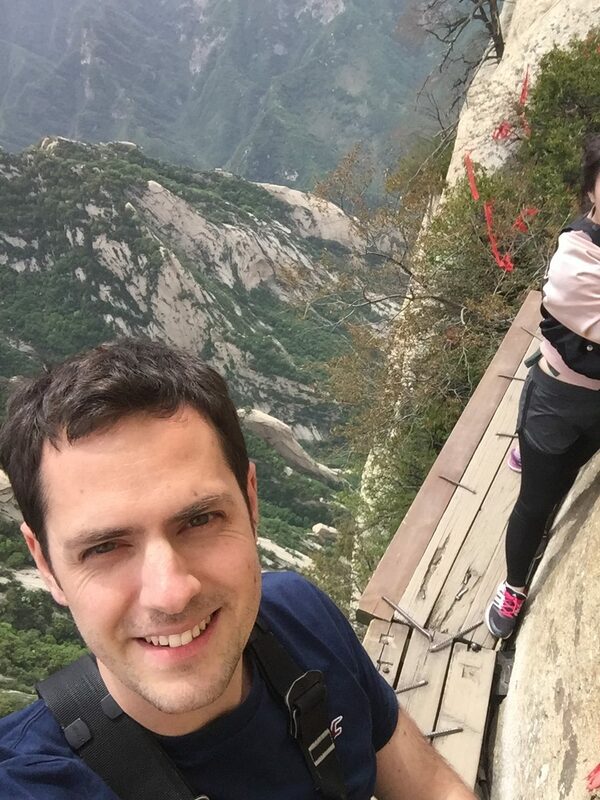 This is prime selfie territory, provided you don’t mind the prospect of dropping your phone into the abyss. Personally, I’d have little problem with that. Continuing along the plank walk for a while, eventually we hit firm land again as the pitch of the mountain recedes enough to allow a thin path. This time, however, it is simply steps etched into the mountainside. This really makes the prospect of two way travel very difficult, but I’m fortunate not to meet anyone on this section. It then brings us out to a small little mountainside temple – nothing particularly impressive, given the method of travel to get to it, but good to be there all the same. Suddenly, however, the reason for the two way travel phenomenon becomes clear. The age old saying of ‘what goes up must come down’ rings true in this instance, and I need to make my way back along the path to safety. All in all, adrenaline quickly took over any miniscule feeling of fear which may have been lurking. Ironically, in fact, the fact that I had been harnessed in made the precarious part of the journey feel safer than the bit before the harness. Being up there, dangling off a cliff like lemmings effectively, a strange sense of harmony and community developed amongst everyone crazy enough to attempt the ascent. We developed a sort of dance to efficiently pass one another, and despite the language barrier, the universal language of humans helping one another emerged. It was a surreal experience.